While it is widely accepted that we are products of our genes and environment, misconceptions about the power of genes to control our destiny continue to dominate our discourse. 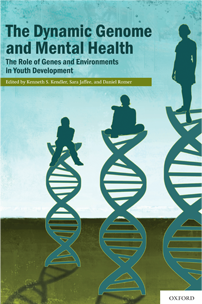 This volume contains the latest theories and evidence supporting the highly dynamic interrelation between genes and environments as they influence the development, mental health, and substance use of adolescents. Written by researchers who are leading the way toward this new understanding, this text provides overviews and analysis of this emerging field. The chapters discuss the latest approaches to gene-environment relations, including gene-environment interaction, gene-environment correlation, epigenetics, and environmental regulation of gene expression. The application of these concepts to the prevention of adolescent mental health conditions, such as drug use, conduct disorder, depression, and schizophrenia, is included. Controversies in the implications of these approaches are also discussed. The chapters are written in accessible language and will relevant to anyone interested in the mental health and development of adolescents, including researchers and practitioners in behavioral, social and medical fields. A final chapter by the editors assesses the implications of these new approaches for future mental health research and policy.